In the summer of 1999, on a small reservation in North Dakota, loving father and Ojibwe Indian, Landreaux Iron, accidently kills a neighbor’s five-year-old son while hunting deer. That dead child is the best friend of Landreaux’s young son and is also a relative of Landreax’s wife, Emmaline. Landreaux, a recovering alcoholic, is horrorstruck at what he’s done. He visits the local Catholic priest and a traditional sweat lodge for spiritual guidance. After a tormented and gut wrenching session, Landreaux and his wife Emmaline decide to give their own five-year-old son, La Rose, to the grieving parents, Nola and Peter Ravich as a reckoning to heal. “Our son will be your son now,” the Irons tell the Raviches. Soon we meet Romeo, Landreaux’s old friend, a druggie who is out for revenge over something that happened between him and Landreaux when they were kids. Romeo threatens the Irons and Ravichs’ fragile and slow healing bond. An emergency room doctor says this when an injured young Romeo comes into the hospital. “‘I believe in this boy,’ he declared. Even though he is the scrawniest, stinkingest, maybe the ugliest kid I’ve ever seen, and in the worst shape, he is from a long line of survivors. He has the soul of a rat.’” It is a compliment, and survival is an important theme, a way of life for many. 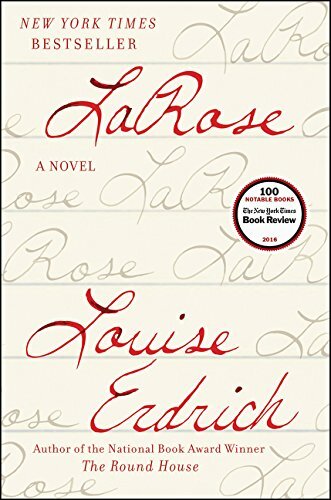 LaRose stacks intricate layers that Louise Erdrich expertly peels back to expose a masterful and heart-wrenching tale of interrelated stories filled with memorable and complex characters and their myths and spiritual quests that guide them. “WISHINGWELLWISHING WELLWISHING WELLWEHYAHHEY-WHENYAHHEY. Ojibwes have a song for everything,” the narrator says. And readers will enjoy this lyrical tale that explores many timely issues including fragile family bonds, friendships, traditions, justices, revenge, and the lengths we take to recompense those. A beautiful snapshot of tragedy, beauty, and honor in families.